Skiing, snowboarding, walking, ice-fishing or a snow scooter ride? The winter’s outdoor activities list is a long one and has to be completed by including a dogsled tour. Dog sledding has its roots in history: travellers and hunters used dog power for transportation of people, food and trade goods, crossing frozen lakes and snow covered plains, taking their loads to places otherwise inaccessible. 33.000 years ago: humans and dogs lived together. Evidence of this first dog domestication is based upon archaeological findings in Siberia and Belgium, telling us also that there has not been a specific place of origin. Presumably these primitive dogs were kept for protection, companionship and maybe also to help on the hunt. Neither the Belgian nor the Siberian domesticated lineages appear to have survived the last Ice Age though. Examinations of the Siberian Altai dog skull revealed that this specimen best matches with the Greenland dog and not (ancient or modern) wolves. Interesting fact for those who have one of the following breeds running around: Tibetan Mastiff, Newfoundland, Chinese Crested, Cocker Spaniel and Siberian Husky. They belong to the haplotype groups that are closest to the ancient Altai dog. 11.000 to 16.000 years ago: the second domestication of dogs, they lived with hunter-gatherers. It predates the beginning of agriculture (10.000 years ago). The use of sled dogs in the Siberian Sub Arctic has been reported in Arabian literature as well by the indefatigable Marco Polo in his thirteenth century writings on his Asian travels. But there are earlier archaeological findings, i.e. the Canadian Thule sites, which tell us that this mode of transportation was in use long before. Alaska Natives used dogsleds for at least the last thousand years, it is believed that the use of dogs in harness was originated by Arctic Native peoples. Dog trains, as they were referred to by the early British and French colonists. The importance of dog sleds in the realm of economic activity can be illustrated by mentioning the development of Yukon as a gold mining area. Known as the Klondike gold rush in the late 1890’s, this feverish period thrived on dog-teams, especially for the postal services. Soon after gold was discovered in the Klondike region of the Yukon, in northwestern Canada, in August 1896, many prospectors made their way to the sleepy Dawson City. Populated by only 500 people in 1896, the town soon became the stage for work and hardship, for hope and frustration. Almost overnight things had changed. By summer 1898, some 30.000 people called Dawson their home, as well as thousands of dogs. Dog teams made it possible that a regular mail service came into function, private and public. The most valued breeds were the Nordic dogs. Husky, Malamute and Eskimo dog: it is said that it all comes down to the same origin. But also other dog breeds were used: Newfoundlands, St. Bernards, setters, spaniels and collies have been recorded to team up with their Nordic companions. On average, each dog would haul up to 50 kg, it was less on more difficult trails of course. Today the City of Dawson, featuring in Jack London’s novel The Call of the Wild, is a quiet place to live. 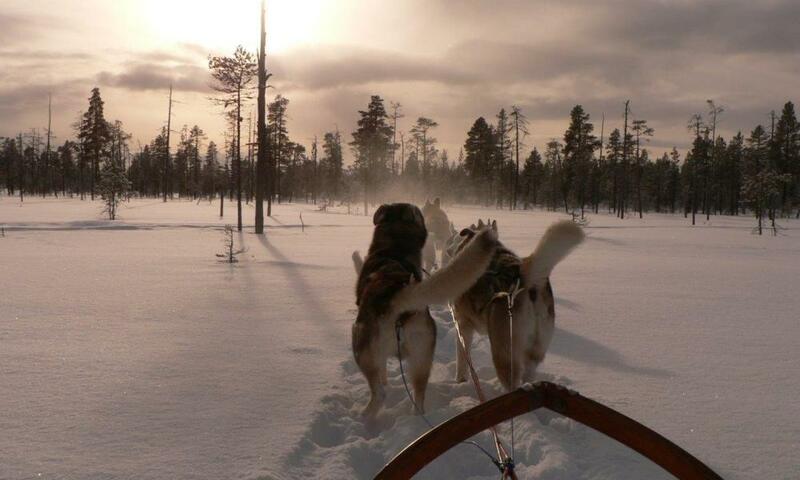 Although a variety of breeds is used for hauling a sled, obviously some dogs will perform better than others. You just cannot attach a pack of ordinary, normal dogs to a sled: it will only be minutes before this setting is a chaotic one. Good sled dogs have in common that they are willing to work (and in a team also), that they have an inborn eagerness to run, and last but not least: they must have good feet. “Especially for racing, a good warming up is essential”, says Erica Friebel. As a professional and owner of a mushing kennel she has specialized in veterinary physiotherapy, massage and acupressure. It goes without saying that the dogs must be physically strong and not prone to digestive malfunctioning. Good sled dogs won’t complain easily. Sour feet, i.e. soles, muscle pains, digestive problems: it is the musher’s responsibility to take early warnings seriously and keep a keen eye on the signals to prevent later malfunctioning. These dogs master the art of concealing pain or discomfort simply because they just want to be one of the team and go. “To state the obvious: one should never take off with a dog that is out of condition. Better to be safe than sorry”, Erica concludes. An aside about qualifications. Do not underestimate the poodle. Also according to the paintings of Francisco Goya the poodle was held in high esteem as pet dog in the Spanish late 18th century. Although not the type of dog you would expect pulling a sled, the poodle has great hunting abilities, especially when it comes to situations where the dog has to act on its own initiative. Poodles are highly intelligent and energetic, and they are…snappy! This withstanding the poodle was one of those breeds that were officially trained in the US program Dogs for Defence, to be a war dog in WW II. But a sled dog? No. For that matter the short statured basset hound, a number one scent dog (and food driven, it must be admitted) would not meet the necessary skills for the working dog either. The best performer in the cold and the most popular at the moment is the Alaskan husky. This dog’s pro’s are an incredible speed combined with endurance. It is not considered a pure breed, they are primarily bred as working dogs. The Siberian husky and the Alaskan malamute, the latter historically sled dog number one, are great sled dogs too, although some mushers are critical about the malamutes because of their slowness. In March, when the famous 1800 km long Iditarod Trail International Sled Dog Race will start again from Anchorage, we will know which is this years favourite breed. Nowadays the most famous race, the Iditarod trail was born out of pure necessity in 1925, when a outbreak of diphtheria in Nome (Alaska) could only be treated with a serum which had to come from Nenana, a town 1100 km away. Inaccessible otherwise, dog-teams were formed and twenty mushers with their 100 dogs achieved the task of delivering the antitoxin within six (!) days. 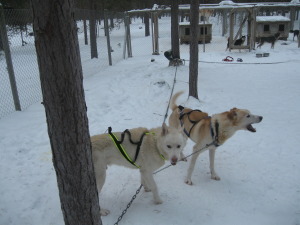 The more relaxed dog sled tours, hence no racing, also require snow, cold and trails. Fascinating in particular is preparation time, almost one hour. As and when you are lucky enough to be present at this event, you’ll experience a situation completely different from what will happen next. In other words: the eager forerunner of calm running. It all starts when the sled dogs are freed from their kennel, the dogs that haven’t been selected will bark, howl and jump like mad. The lucky ones, at first behaving the same, eventually will calm down a bit while being prepared and fastened into the bindings. Excitement and howling is now all over the place. This is not the time to be fainthearted, because in the last five minutes or so before the sled takes off, you’ll believe you ended up in a place next door to Dante’s Purgatorio. And then, all of a sudden, the anchor is lifted (you will have to let it rest on your lap to throw it overboard in case of emergency), the dogs start to run and an overwhelming silence is what lasts. The dogs do what they like most, they run. No barking, no howls, it is nature’s teamwork now aiming at one goal only: a great ride for all. A beautiful snow covered landscape equals the Elysian planes. On the Altai dog, find this article: Ancient DNA Analysis Affirms the Canid from Altai as a Primitive Dog. On sled dogs: NatGeo – What Makes a Great Sled Dog? Breed, Ambition, Tough Feet. On the history of the use of sled dogs, especially in the fur trade, find this Two rivers, Alaska article. On the origins of dogsled mail: Canadian Museum of History. 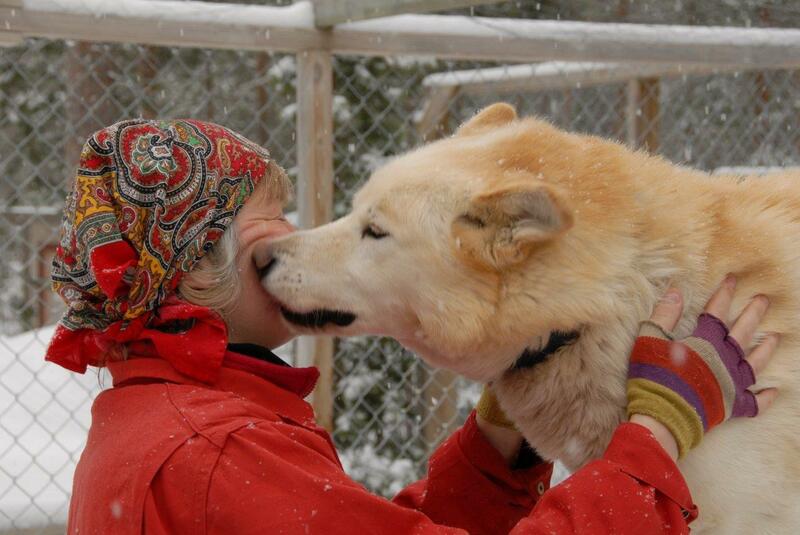 My dogsledding tour was with Huskygård (Dalarna, Sweden), owners Erica and Peter Friebel. Alas they don’t go with the dogs anymore, not commercially that is….